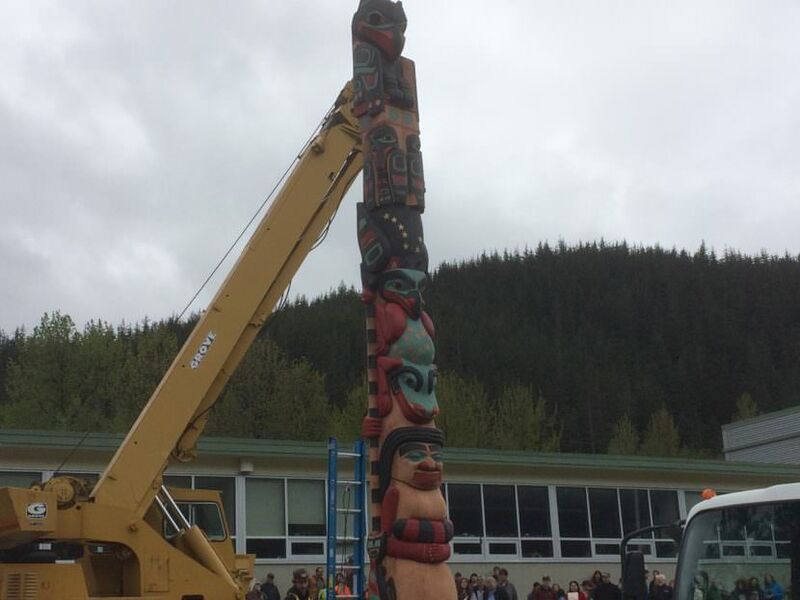 The T’aaku Kwáan of Douglas Island raised a totem pole in front of an elementary school Saturday to mark the site of a disturbed graveyard. The pole symbolizes the pain of historical trauma and a need to heal. 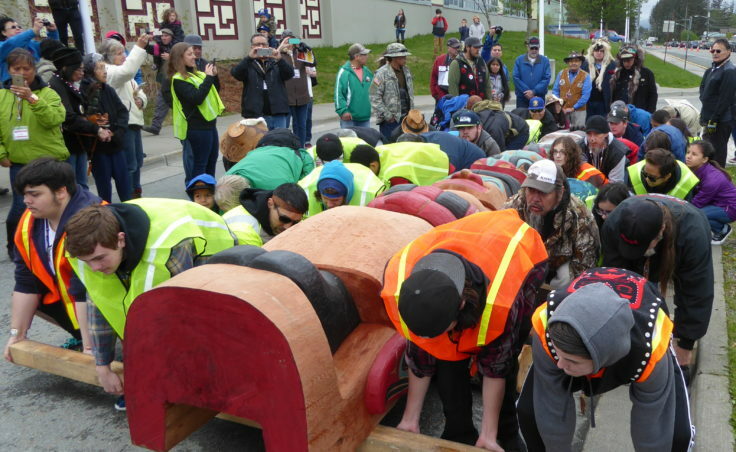 A couple dozen volunteers prepared to bend their knees and backs to grab wooden beams underneath a 26-foot, solid wood, Raven totem pole laying on its back. Like pallbearers, they lifted the pole and slowly carried it toward a crane waiting to lift and place it on a metal base sitting in front of Gastineau Elementary School. Event organizers warned them to call for help if they felt like the weight was too much. “For those of you on the sides, we’re going to need you to switch out if somebody says help. We don’t want anybody getting hurt trying to move this,” one man ordered. 61 years ago, Gastineau Elementary School was built on top of a graveyard for the Tlingit T’aaku Kwáan. 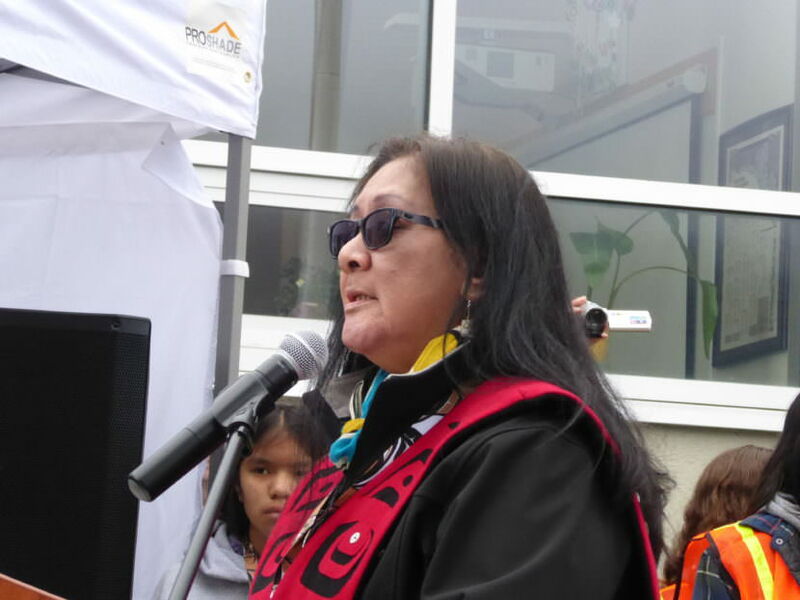 Goldbelt Heritage Foundation, the Douglas Indian Association and the Juneau School District organized the totem pole raising and a ceremony to reflect on “social injustices” inflicted on the T’aaku Kwáan. Andrea Cadiente-Laiti was the keynote speaker at the ceremony. She sits on the Goldbelt Heritage Foundation’s board and she’s also the tribal administrator for the Douglas Indian Association. She said construction workers accidentally unearthed three burial sites on the school property in 2012. Five people were in the graves. Cadiente-Laiti said another man was buried with what might have been his prized gun collection. She likened building Gastineau Elementary over the cemetery to someone building “an office building over Evergreen Cemetery,” a 9-acre memorial in Juneau that the city estimates over 8,000 Juneau residents have been buried in. Cadiente-Laiti and other speakers also recalled the impacts of the city of Douglas’ intentional burning of Douglas Indian Village in 1962, decisions to build roads over graveyards, property loss, the loss of fishing rights and the suppression of the Tlingit language. Cadiente-Laiti said those actions had powerful effects that were passed down to today’s generations. “We don’t necessarily feel it, or see it, or taste it, but somehow through our parents we know it’s there. We see their sadness,” Cadiente-Laiti said. It is hoped that raising the Raven totem pole will pay respect to the grievances of the past, restore the T’aaku Kwáan’s ancestral connection to the land, and signal their desire to heal and move forward, culture intact. The organizers plan to raise a second totem pole at Savikko Park next spring. The second pole will recognize the Yanyeidì clan and the 1962 burning of Douglas Indian Village.